I am struggling with a strange situation (I am pretty sure it’s a bug). Arriving airplanes never have any baggage on board. None of them. Not a single bag in a hundred flights. They always state “Baggage unloading not requested”. 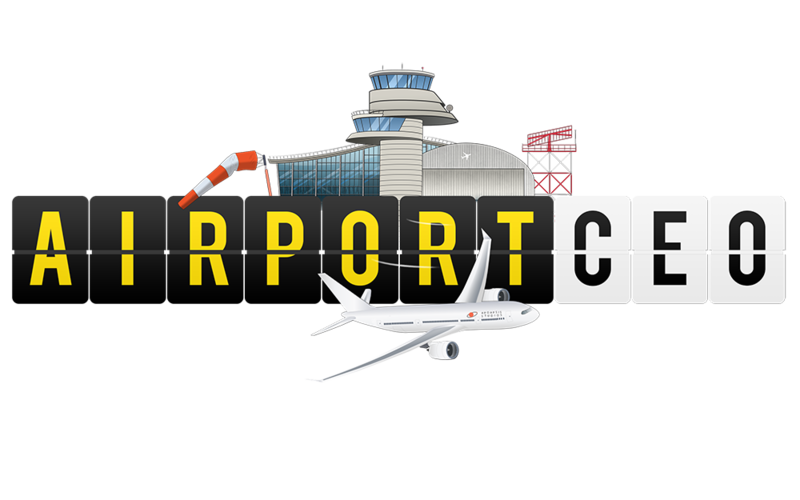 However, departing passengers do have baggage, and it is loaded correctly. 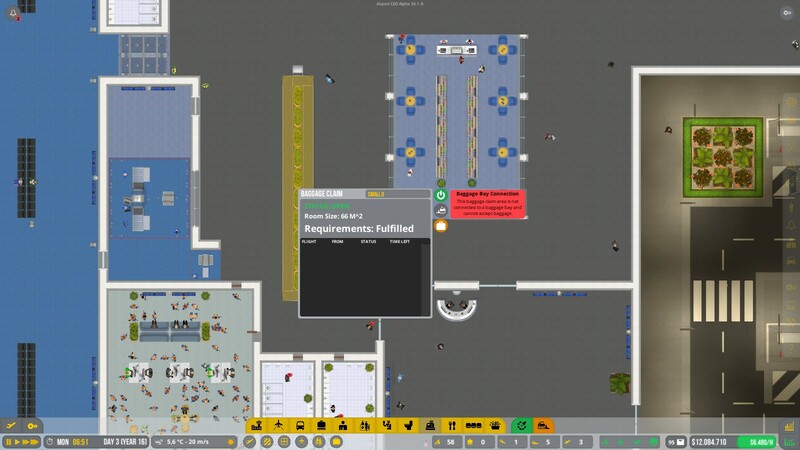 Hiring an army of ramp agents (the staff rooms are now overcrowded with them). Cancelling all airline contracts (took quite some time to cancel all the flights) and sign new ones. Unfortunately, all that didn’t help. Does anybody know this problem and/or a way to fix it? This does indeed sound very strange. Can you provide a few screenshots where it says that uloading is not requested? I assume you are on the latest version and have ramp agent service and baggage handling enabled (the usual questions)? have you had any vehicles? The game was lastly updated a week ago. According to the description it’s been an update with minor bug fixes. 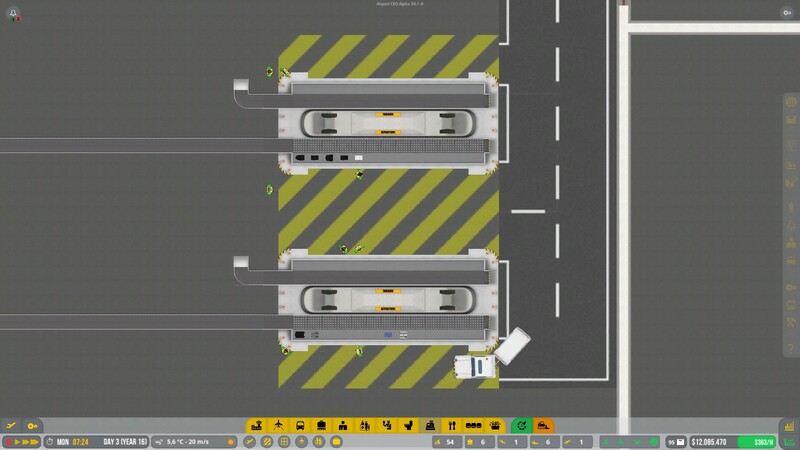 Ramp agent service and baggage handling enabled. Baggage is actually loaded onto the planes, but strangely they never carry baggage to unload anymore (they did so when I implemented baggage handling). @Sepone Can you please post a picture of the flight planner? @BottleRocketeer Here is the flight planner. 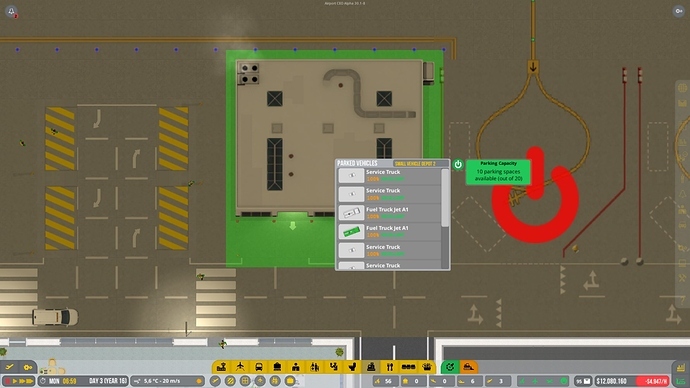 The Auto Scheduler is activated (the check icon is hard to see because graphics quality is set to Fast), Minimum Flight Separation is 60 minutes and Flight Delay Option is set to Always Delay. @NoPro Norman, you’re not a NoPro, you are definitifely a Pro. 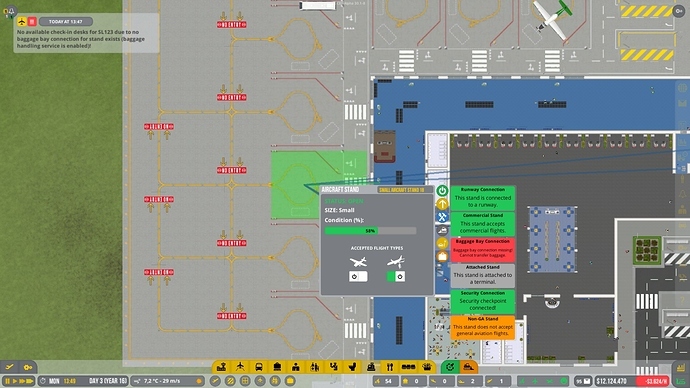 The baggage claim areas were activated, but not connected to a baggage bay. Thanks a lot. I have changed nothing regarding the baggage system, nothing at all. I’m sorry, I was wrong. 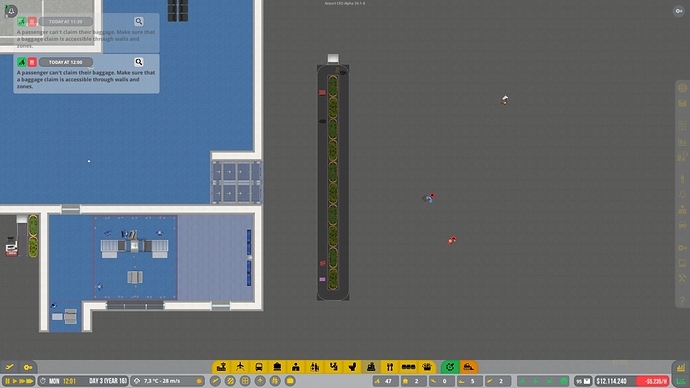 I forgot that I did indeed replace the baggage bays to make space for a scanning section. I reconnected everything except the claim areas. My fault. A notification, a red info panel or a darkened baggage claim area would have helped to solve the problem. 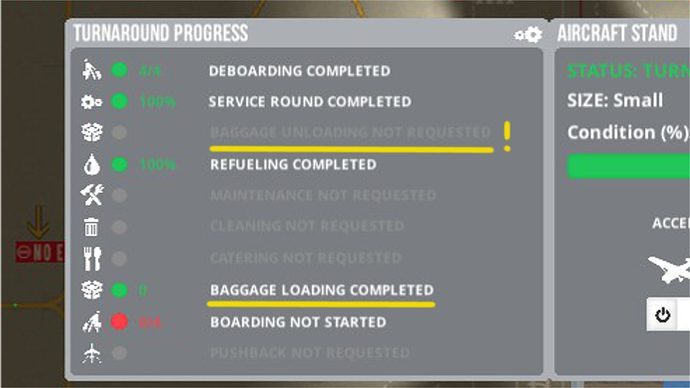 Aircrafts stating Baggage unloading not requested shown in grey did suggest everything else is fine. @Olof Ah, it just occured to me that I filed a bug report using the ingame application. 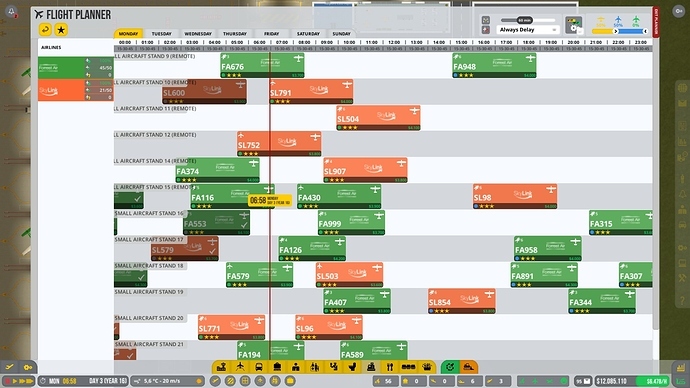 Since this problem turned out to be no bug, I wonder if you could take care of that unnecessary report. If I remember correctly the title is “No Arriving Baggage” and it was send late April 9th or early April 10th. Sorry for the inconvenience. 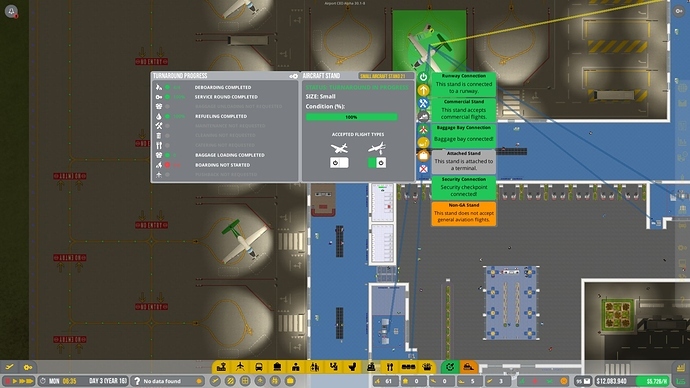 No problem at all, in the end it is perhaps somewhat poor game design on our end so I’ll make sure we don’t consider it a bug but will keep it in mind.